As Greater Boston creates more jobs and attracts more residents, car commutes have slowed to an excruciating pace. In transportation, basic geometry poses a problem that no app can ever fix. At the dawn of the the automobile era, if 100 people puttered around Boston in Model Ts, they took up far more square footage than the same number of people riding in the nation’s first subway tunnel. By the mid-1980s, when the Central Artery had become an elevated parking lot, 100 motorists in Yugos and Chrysler K-cars occupied more space than the same number of passengers in a single subway car. And a decade or two from now, 100 commuters who hail fully autonomous Ubers and Lyfts will still need more room than the 100 people who fit comfortably in the Red Line’s oldest, jankiest car. Even if the line’s peak capacity — about 15,000 passengers an hour — never improves, the it will be able to move far more people through Boston and Cambridge than a lane full of autonomous vehicles with a single rider in each. Not coincidentally, the main dilemmas facing future policymakers will be the same exact ones we face today: (A) How much should we invest in traditional public transit? (B) And when more people prefer to ride alone in cars than the street grid could possibly accommodate, what do we do? The answers are obvious: (A) A lot. (B) Charge them for the privilege. Also, (C): Don’t let techno-utopianism become a pretext for doing nothing. 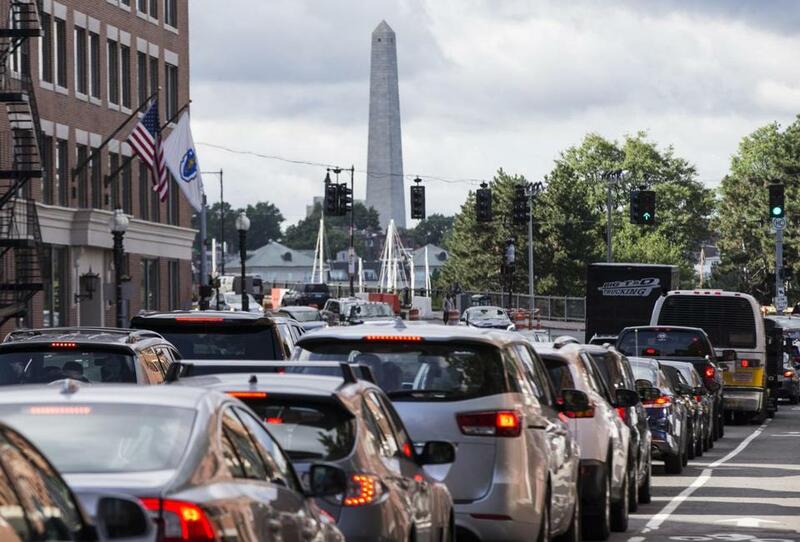 As Greater Boston creates more jobs and attracts more residents, car commutes have slowed to an excruciating pace. But while economists love congestion pricing — i.e., making people pay for the street space they use and the damage their cars inflict on the environment — it rankles Americans who’ve been raised to view driving alone as a human right. And in cities around the country, the advent of fully driverless cars, which could be many years away, has become an excuse for not building high-capacity transit networks. Autonomous vehicles, The New York Times reported this summer, became a major talking point in anti-transit campaigns in Indianapolis, Detroit, and Nashville. Autonomous vehicles could prove transformative. They might, for instance, save thousands of lives, because humans make terrible drivers. They could also upend the way governments pay for transportation; if commuters use shared electric vehicles instead of buying their own dinosaur burners, gasoline and excise taxes will dry up. What autonomous vehicles won’t do is make traffic jams disappear. Someday, a driverless car could drop you off at work at 9 a.m. But what if, instead of parking itself in a private garage — which would cost money — it just circles the block until it picks you up at 5 p.m., because we refuse to charge motorists for the use of most streets? Some key tech firms do recognize they that can’t just flood the streets with robocars, and that a limited amount of pavement needs to be rationed somehow. Ride-hailing giant Uber is a leading advocate of congestion pricing and, in some markets, is starting to sell public-transit tickets in some markets. Lyft recently bought Motivate, which operates bike-sharing systems in Boston and elsewhere, and is rolling out tiny electric scooters. Aptiv Automated Mobility, which recently absorbed the MIT driverless-car spinoff nuTonomy, is “working with municipal partners to improve mobility and access, remove barriers in living a car-lite lifestyle, and address critical transportation and emissions reduction goals for the city,” Karl Iagnemma, the unit’s Boston-based president, said in a statement. Under the right set of public policies, and with the right pricing structure, fleets of shared autonomous vehicles are a useful complement to high-capacity transit systems; with both in place, there’s no excuse for driving your own car downtown. Then again, the tech industry excels at designing irresistible products for individual consumers, not at solving collective problems. Meanwhile, carmakers like to sell as many vehicles as they can. As autonomous vehicles mature as a technology, GM or Toyota might find it more lucrative to sell them to individual consumers at a generous markup, rather than to shared-mobility fleets at a bulk discount. That’s all the more reason why Greater Boston can’t sit around waiting to see whether and how driverless cars will evolve. We’ll never squeeze enough cars into crowded spaces to get people where they need to go. In the end, no artificial-intelligence algorithm can change the laws of physics. Plan accordingly. CORRECTION: An earlier version of this piece misspelled the name of Aptiv Automated Mobility executive Karl Iagnemma. Mike Ross: Could Elon Musk’s Hyperloop help commuters in Massachusetts?